This week you, our loyal readers, will be getting Hail Pelicus Light, the same great taste of a regular Hail Pelicus but with only half the calories. The reason for this promotion of Diet HP is that there isn’t all that much rugby going on at the moment and reminders need to go our regarding requesting referees, our AGM and the Kit Store. We here at HP would also like to post the first write up from our newest international correspondent Pelicus Miratus Velocitas. Exciting times here at HP. 8:30 am: arrival and warm up for the Yo-yo fitness test at 9:00 AM. Reports will be in the Google environment and all referees society members will have the ability to pose questions. Report committee authors will answer the questions that are posed. Vote to replace Scott Wood. James Hinkin was appointed by the board to replace Scott until the AGM. If you have an interest in serving the referee community by becoming a member of the board please email me. We will have an election based on those members who wish to serve on the board. If you will not be present at the AGM but wish to cast a vote, provide a member of the society with your proxy by emailing the member in attendance and give them right to vote on your behalf and include Pete Smith in the email. Pete will keep track of who is voting by Proxy. Dan Wilson and another member of the society, to be determined at the meeting, will be responsible for counting the votes. 12:30-1:00 Lee Bryant and Steve Fenaroli to present “Pathways to National assignments”. While rumors of my demise in San Francisco are greatly exaggerated, to paraphrase Mark Twain, it is true that I am now a legal resident of the United Kingdom: it’s official. I’m writing this from a Hertfordshire (“Herts”) town that’s about an hour north of London, and the five days I’ve been in this country as a guest, vs. many previous times as a frequent visitor, have been jam-packed with UK immigration administrivia, family time, shaking the work bushes, and house-hunting. They have also been productive from a rugby standpoint. Over the last few weeks I’ve been in touch with the ladies & gentlemen of the London Society of Rugby Football Referees (“LSRFUR”), who kindly accepted my application to join their society, and promised they would put me to work refereeing once I arrived here. Because I expect to be spending the majority of my UK time in Herts or central London, they allocated me to their North Region, which is one of 4 semi-autonomous regions of the oldest (1889) and largest (500+) referee societies in the world – for more info, take a look at www.londonrugby.com. I’m here for less than a week on this trip, before I fly back to California to attend our AGM and take care of some other business. Given the quick turnaround and my full schedule, I wasn’t expecting to be able to referee in London until I had a 3-week block of time in the UK between Halloween and Thanksgiving. In this case, fortune favors the flexible, and on Tuesday evening I picked up a late assignment for a universities match on Wednesday afternoon. London being a fairly dense city with lots of open space, I left a meeting with a recruiter in the City of London at 1130, stopped at my flat so I could quick-change from my banker suit into suitable pre-match rugby attire, jumped back on the tube for a few more stops, and was at the pitch just 90 minutes later having never set foot in a car. Having spent plenty of time in London, this should not prove to be unusual in the future. SOAS is the School of Oriental & African Studies, LSBU is London South Bank University, and BUCS is the British Universities & Colleges Sport organization, under which high school & university rugby is played in the UK. At the coin toss, I surprised the skippers by telling them they would be playing for my NCRRS necktie to commemorate my first match assigned by LSRFUR. We kicked off at 1400, on a day that couldn’t have been more perfect for rugby. It was in the low 60s with a slight breeze, the pitch was firm and fast, and the leaves were just starting to fall off the trees. We had perhaps 50 spectators, plus passerby enjoying a bit of rugby during their walks in the park. SOAS wasted no time opening their account with a quick try after catching the defense napping, followed by another one scored around the outside. Soon after, SOAS took a quick-tap penalty ~15m out from the defending team’s posts, only to see the player taken out by a LSBU defender who made no effort to retire 10m. Being an English league fixture, a yellow card was appropriate without prior warning. I keep my yellow card loose in my pocket for occasions like this – players seem to take heed when it’s drawn quickly in situations like this. The card didn’t have any effect on the outcome of the game, because SOAS went on to score 4 more tries in the half (converting only one) to finish ahead at 32-0. The second half was more of the same, except that we had to go to uncontested scrums due to LSBU losing one of their three qualified front-row players in the team. This was unfortunate for them, because the scrum was one of the areas where they had parity with SOAS, having stolen a couple of tighthead hooks. Ultimately, SOAS steadily added to their lead by scoring another 6 tries, but converting only three. This pitch, like many English pitches, is a full 100x70m with 10m in-goal areas, so I worked hard to be at the tackles, on the spot for the scoring, and to make most of the touchline calls myself. Each side supplied TJs, who were willing (when not completely absent), if unsure how to do their job, so it was up to me to make the close calls while working with somewhat faded markings. I hadn’t refereed a 15’s match since May 5th, and I was happy that I was in the right places at the right times. The 7s tournaments over the summer definitely helped with this. One major difference I’ve seen in the English game is the players’ instinctual desire to look for the offload in the tackle. Another is the higher amount of communication between players. LSBU was missing several first-team players, which didn’t help their cause, but they did not stop fighting even though another one of their players was sin binned for a careless high tackle around the 60′ mark. LSBU finally got on the scoreboard by finishing the match with a great breakaway try from midfield, with the result firmly in SOAS’ favor at 68-7. Everybody was happy after the match, including LSBU. Both teams were very thankful that I could do the game, because the night before, they weren’t sure they would have a referee at all. We adjourned to the locker rooms below The Hub, where I realized that like a rookie, I had brought no shower gear with me other than sandals (they only happened to be in my bag because I’ve been juggling luggage for the last week). I have reffed enough in Europe to know better than that, but I rinsed off the sweat, dried myself off with a spare shirt, and packed up my stuff in time to follow both teams as they walked to the post-match function at The Metropolitan Bar (a large, nicely appointed pub) next to the Baker Street station in Marylebone. The hike was a little over a mile, and as the group of ~100 players and supporters made their way through the park, I got to see some great reactions from the tourists, pensioners, and other civilians coming the other direction. It was more than enough to put a big smile on my face, and the walk was a good additional cool-down as well. After each team had had a pint or two, they did their usual man-of-the-match awards, with the winners taking a spot in the boat race. Once that was concluded, I got up and gave my own very short speech to thank all the players for a very positive match almost completely free of foul play. I opened the speech by telling everyone that this was the first rugby game I had ever refereed… [loud applause]… as a member of the London society [heckling]. Then, I awarded my NCRRS tie to Redvers, the SOAS skipper, and asked him not to do anything dumb while wearing it. When the crowd heard I was from California, a spontaneous “USA! USA! USA!” chant broke out – ‘merica! I said thanks again, stepped down off the bench, and left the players at the pub not long afterwards to return to Herts, happy that the match went well and that both sides were content. I’d like to thank LSRFUR for this assignment, which I hope will be the first of many; my new friend Robert Brewer for taking the photo of me with the two skippers at the coin toss; the gentlemen looking after my stuff the referee’s locker room while I was stretching my legs on the pitch; and the various players who took their turns on the touchline with my flags. What a great way to open a new chapter in my refereeing career! Our very own Pelicus Procrastinorix in perfect position and showing great form when awarding a try to Chico St at the Stanford Women’s Rookie 10s. 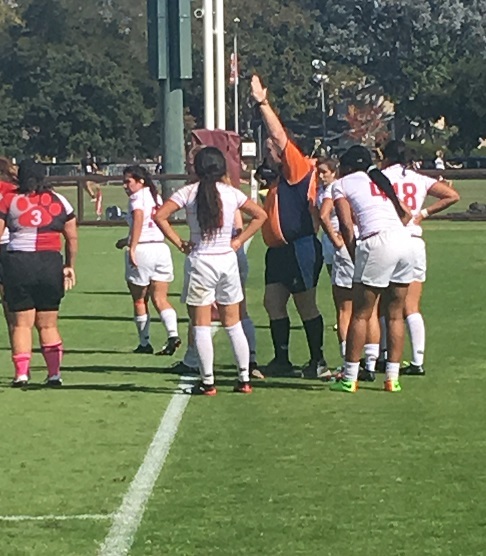 The ladies from Stanford seem less than pleased with the decision, although I am sure they admired the professional manner with which the try was awarded. This entry was posted in News on October 26, 2018 by James Hinkin.